For a long time dominated by a Ministry of Defence military zone, Divis was acquired by the National Trust in 2004 with assistance from the Heritage Lottery Fund and the Department of the Environment NI. About 1 km W of the summit on Armstrongs Hill is the site of a cairn, which is named Carn Sheaain Bhuidhe (Yellow Johns Cairn) on the 1:25,000 OS map of Belfast City LGD. F. J. Bigger suggests that the Seán Buí in question was one of the O'Neill dynasty (Proceedings of the Belfast Naturalists' Field Club, ser. 2, vol. iv (1893-94, 105). There were several chiefs of the name Shane O'Neill. Although Divis and Black Mountain are nowadays perceived as names for two separate peaks, both are ultimately derived from the Ir. Dubhais [DUPN], 'black ridge/peak', Divis being an anglicisation and Black Mountain being a (loose) translation. The name Black Mountain is now applied to the lower peak which immediately overlooks West Belfast. This has given rise to another Irish form, An Sliabh Dubh, but it is important to realise that this a recent back-translation or re-Gaelicisation from the English form. Divis is the highest hill in the Belfast Hills area and the 634th highest in Ireland. 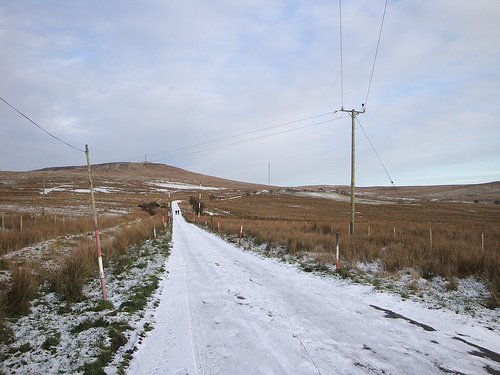 Divis is the most westerly summit in the Belfast Hills area.